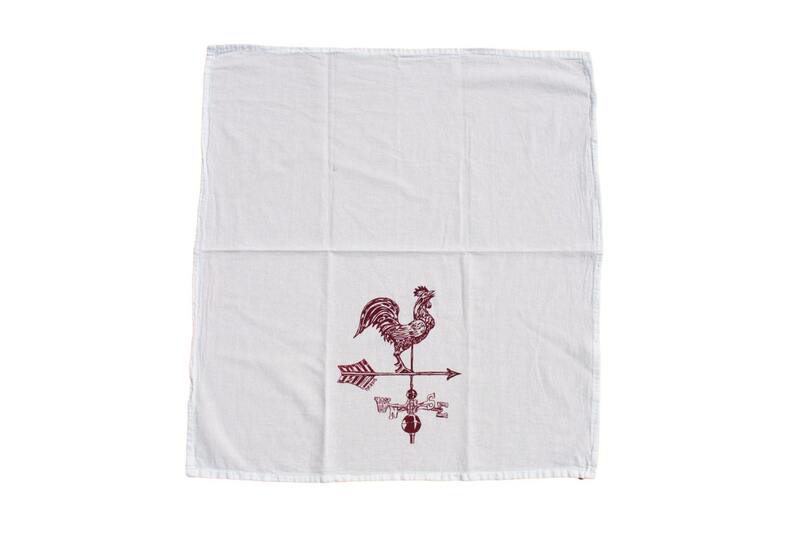 This is a cream color flour sack tea towel featuring an image of a burgundy rooster weathervane. I personally hand draw all of my designs and hand pull all of my screen print images. The printed cotton tea towel is eco-friendly, 100% cotton. They are nice and thick and will stand up to everyday wear. I use high quality water based inks that are earth friendly and long-lasting. This eco friendly cotton flour sack tea towel will make a lovely hostess gift, bridal shower gift, wedding registry gift, house warming gift, dinner party, Christmas gift or wedding gift. 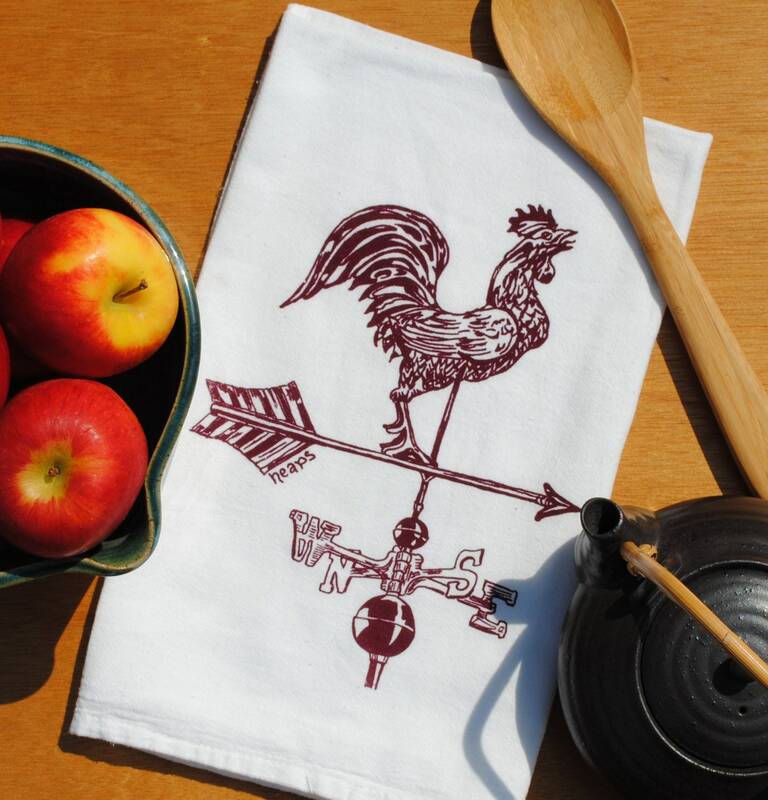 This flour sack tea towel will also make a charming addition to your own kitchen. I’m an approved Etsy Wholesale seller. Ask me for my linesheet. We accept payment via Paypal and credit card. Shipping discounts are automatically calculated for multi-item orders. Please note that delivery times vary significantly based on your location, efficiency of your postal service and any holidays during transit. We are not responsible for any delays in transit, customs delays or customs fees and duty, or VAT. We want you to have an enjoyable buying experience from us. We take great care in ensuring that we accurately present our products in our photos and descriptions. Quality is important to us and we inspect every piece that we create and send to you. If you wish to return an item within 5 business days of receiving it, please contact us via email. Returns/refunds/exchanges will not be accepted without contact via email prior to shipment back to us. Refunds/exchanges do not include shipping fees or customs fees, either shipping to or from you; these are the purchaser’s responsibility. If for any reason you are not satisfied with your order, please email us immediately. We take pride in our work and we value our customers. We’ll be happy to work with you to make your experience a positive one! We value our feedback score. When you receive your order, please send us your positive feedback! If you are not completely satisfied, please contact us prior to leaving negative feedback, we’d prefer to resolve the issue and make you happy! All photos, designs, and illustrations are copyrighted by Heaps Handworks and heapshandworks.com. Please do not copy, reproduce, or duplicate our photos, designs, or item descriptions and do not present them as your own in any form. To fulfil your order, you must provide me with certain information (which you authorized Etsy to provide to me), such as your name, email address, postal address, payment information, and the details of the product that you’re ordering. You may also choose to provide me with additional personal information (for a custom orders, for example), if you contact me directly. Bought these for 3 separate women in my life for Mother's Day and they each loved them! Very nice quality and rich saturated colors! Will be buying again!